The quest and passion for performance, speed and precision. This is the GRAHAM tribute to the most advanced automobile technique. This is also the success story of the Silverstone Stowe GMT chronograph. The unique timepiece pays tribute to the golden age of car racing and its valorous spirit. A limited series of 500, the Silverstone Stowe GMT is on the road of legends. No tie, no dinner jacket, no limousine. Today’s dress code is yellow and green. Gentlemen, please put your racing suit on, jump in your car and line up on the grid and start your engines. Once the pistol fires, your eyes will witness true performance. 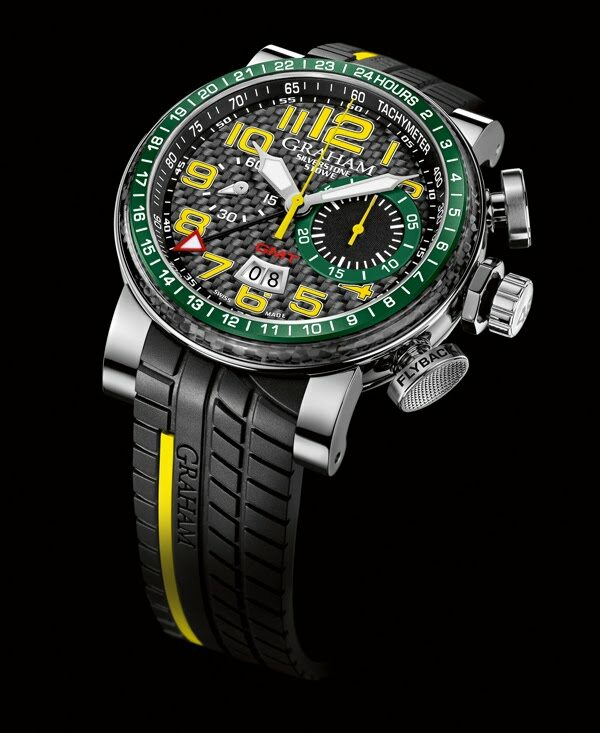 The Silverstone Stowe GMT carries powerful connotations to the race. GRAHAM has developed a true wrist machine which carries impeccable control and state-of-art technology. Main features also include: 48 mm steel case, calibre G1721, automatic chronograph, 28 jewels, 28’800 A/h (4Hz), Incabloc shock absorber, 48 hours power reserve, domed sapphire crystal with anti-reflective coating on both faces, see-through sapphire case back with limited edition serial number engraved, integrated black tyre tread rubber with yellow inset, available on steel bracelet.